Who is praying bold, tenacious prayers for you? For youth? I know I am who I am because of the prayers of others.I know I am where I am because of the prayers of others. One person, in particular, has been praying bold, tenacious prayers for me since they first met me about 19 years ago, before I was following Jesus. Rich led an on-campus ministry at the University I attended. His prayers have followed me all my days, as he continues to pray for me through the good times and the challenging times. When I felt like nothing and my life looked more like a pile of rubble and uncertainty – Rich prayed God’s best into me. When leadership, ministry, and God’s shalom was but a pipe dream for me, he prayed. When I was searching for faith. He prayed. When my doubts overwhelmed my faith. He prayed. When I flunked an exam and thought my life was over. He prayed. When relationships ended. He prayed. When areas of my life still had a ways to go to line-up with the ways of Christ. He prayed. When I didn’t know what my future would hold. He prayed. When I ended up leading a ministry, with zero training. He prayed. When I had decisions to make. He prayed. When I have led events. He prayed. When I have preached. He prayed. When I did nothing. He prayed. When I hit valleys. He prayed. When I discovered mountain tops. He prayed. I mean it when I say, I have no doubt that I am the person I am today because of Rich’s prayers and the prayers of other faithful people. It is overwhelming when we think of all the people who have prayed for us through the years – grandparents, parents, Aunts, Uncles, friends, mentors, leaders, siblings, spouses, kids… It is overwhelming when I think of the faith Rich (and others) had in those prayers, when I didn’t have the faith to believe the things they were praying - about God or about myself. They believed it and prayed it before it was seen. That’s faith. That's tenacious. Who prays for you? Prays the deep, bold, tenacious, faith prayers for you? Especially when you can’t pray them for yourself. Who are you praying for? Who is praying for our youth? Youth need someone who will pray bold, tenacious prayers for them. This Sunday is the National Day of Prayer for Youth. 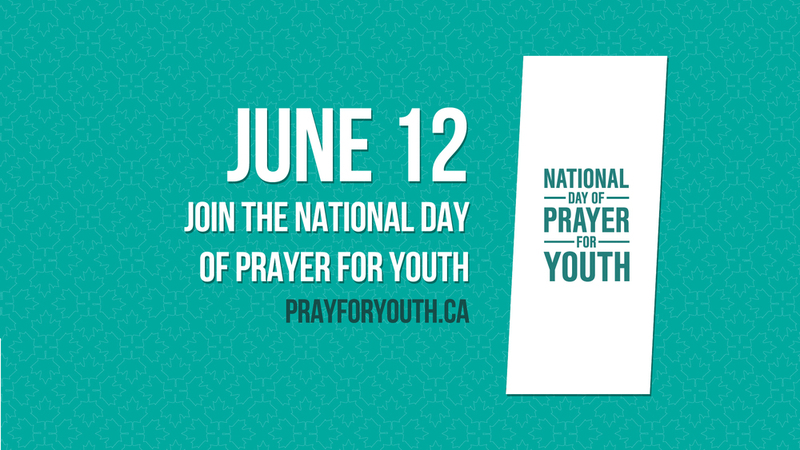 (http://www.prayforyouth.ca/) Join in praying bold prayers for our youth. Here are some ways to incorporate praying for youth into your rhythms: • Get a picture of the youth group from your church and put it on your kitchen table. Every time you say grace pray for the youth group too. • Weekly walk the perimeter of your local school, praying. • Ask if the youth leader in your church would get permission to give you the picture and some background information about one youth they know. Pray for them regularly. • Scan the news for where youth are mentioned (in good ways and in difficult ways). Pray for them. • Find out the names of either the youth leaders, coaches or teachers in your area. Pray for these people who form our youth. • Get a Q-card and write out a bold prayer for a youth you know. Pray it regularly. If it is appropriate, give a copy of the prayer to the youth. • Notice the teenagers in your day - working at the check out, cleaning your table, biking by, waiting outside the school, on the bus... Say a silent prayer of blessing for the teenager, as you pass by. • If you have a youth in your home or a youth you are close to – ask them regularly “What’s the most important thing I can be praying for you right now?” and pray for them on the spot. • Ask a local Christian camp what their prayers requests are. Write them down and pray for them. Camps minister to many children, teens and families throughout the year. • Encourage your church to pray for youth. Start a prayer wall or build a prayer labyrinth at your church/youth group. To create a prayer labyrinth, take rope or candles and make a labyrinth design on the floor. Every so often in the labyrinth put cards with prayer requests. Participants pick up a card and pray for what is on the card as they walk the labyrinth. When they are done that card, they pick up a new card.